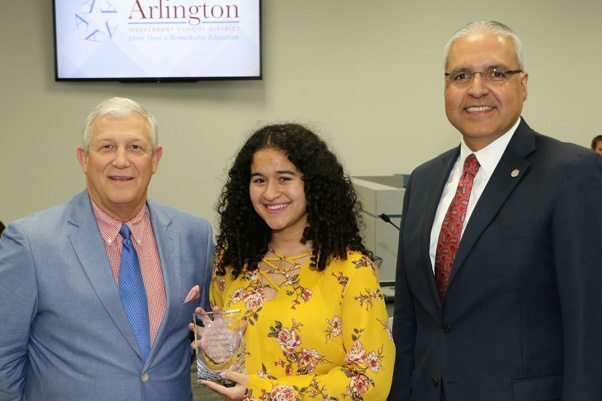 Congratulations to Alexis D., a senior at Venture High School, our April 2018 High School Student of the Month! Alexis will be graduating a year early on the Distinguished with Endorsements path with more than 26 credits. She has persevered to become a high achiever. Alexis works at Six Flags Over Texas, often working double shifts. She has applied to many universities, getting accepted into two schools while also receiving a scholarship. Alexis has not let any struggles or other barriers stop her from achieving her dreams. She is the epitome of Venture’s motto that “Great Things are Happening at Venture.” Congratulations, Alexis!